Village Picnic, 4th of July, Road Projects & more! Wind Point Village Picnic - Sunday, August 12! All Wind Point residents are invited to the Annual Village Picnic, returning to Village Green park and pavilion on Sunday, August 12, 2018! The event will be from 3-7 p.m. and will include a picnic-style buffet catered by Danny's Meats, live music, bounce house, face-painting, local craft beer from Public Brewing Co., roasted corn, meet a police officer and firefighter and more! Tickets are now available online through August 1, 2018. The cost is $7 per adult (age 10 and up), $3.50 per child (age 4-9) and children under 4 are free. Admission includes refreshments and dinner, which will be served between 4:30 and 5:30 p.m. For assistance with purchasing tickets online, please call the Village Office at 639-3524. Restrooms are on site. In addition to the pavilion area, a large tented area will be provided courtesy of Johnson Bank. Some picnic tables will be provided but it is suggested to bring lawn chairs. The Village Picnic is organized by the Village of Wind Point in conjunction with the Wind Point Community Club, a non-profit group that has been promoting social activities in Wind Point since 1923. Note the picnic is limited to Wind Point residents. Click Here to Order Tickets to the Village Picnic! 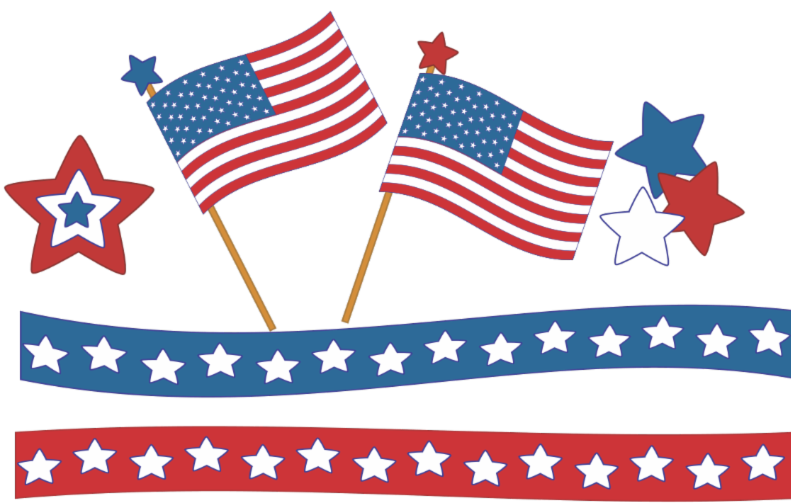 The Village Office will be closed on Wednesday, July 4 due to the holiday and will re-open on July 5. All collections services (garbage, recycling, yard waste and bulk items) will take place as scheduled on Monday, July 2. The Racine 4th Fest fireworks display will take place at dusk on July 4 (approximately 9:20 p.m.). They can be best seen from North Beach in Racine. For a listing of other fireworks shows in Wisconsin, visit fireworksinwisconsin.com . Please note that fireworks that propel into the air are prohibited in the Village. Fireworks and related toy items that stay on the ground are allowed, but loud noises (especially at night) may be considered a nuisance under Village ordinances. Please be respectful of your neighbors, especially to combat veterans and others with sensitivity to loud noises. Have a safe and happy 4th of July! Road resurfacing work is planned to take place this month on sections of Campus Dr. and Wind Point Rd. with patching work on Four Mile Rd. The re-paving on Campus Dr. will take place between N. Main St. and Deepwood Dr. and it will also include drainage improvements along this road section. The work on Wind Point Rd. will occur on the public road section between Park Pl. and ending at about 5310 Wind Point Rd. The repairs on Four Mile Rd. will be near Valley Tr. and James Ave. The road construction will involve the removal of existing asphalt and laying new asphalt. Roadways and private driveways will be accessible throughout the project but delays can be expected while the work is in progress. 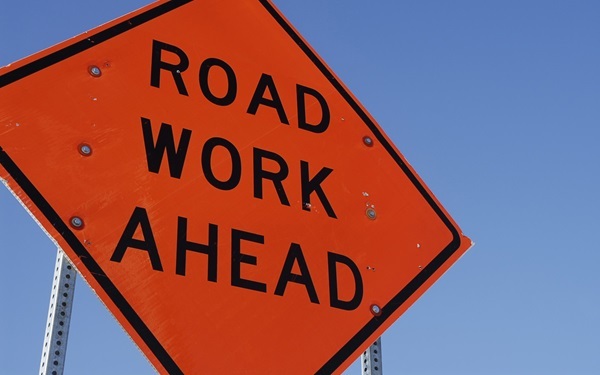 Work is anticipated to begin the week of July 9 and should conclude by the end of the month. For any questions, please contact Village Administrator/Clerk-Treasurer Michael Hawes at m.hawes@windpoint.org or 639-3524. 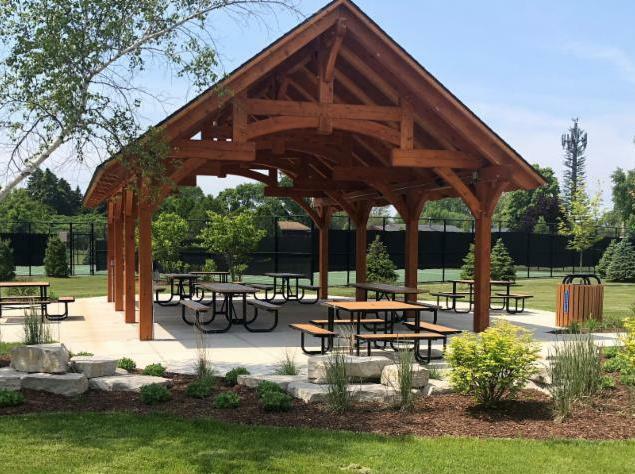 The final draft of the Comprehensive Outdoor Recreation Plan (CORP) was adopted by the Village Board on June 14 - click here to view the adopted plan ! The CORP provides a n inventory of existing outdoor recreation amenities in the Village and identifies opportunities for future improvements. The plan follows a format prescribed by the Wisconsin DNR for CORPs. By having a CORP, the Village will become eligible for certain grant programs to help fund projects. 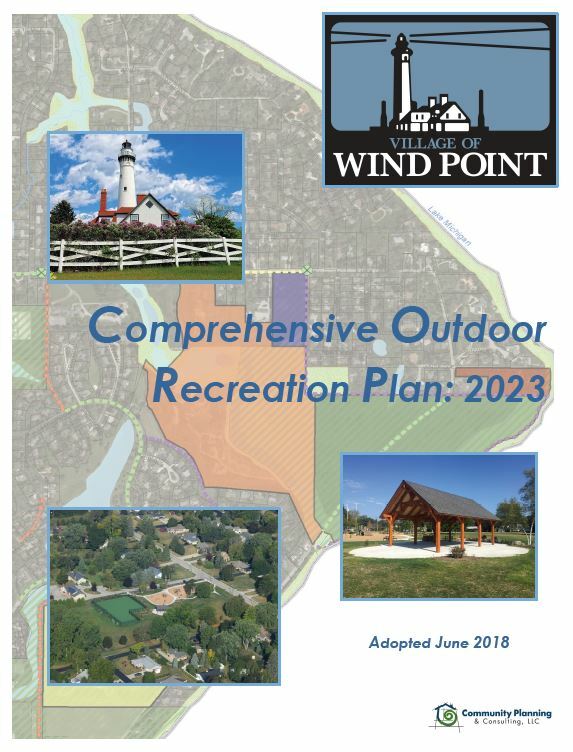 Many of the plan’s recommendations involve enhancements to the Wind Point Lighthouse grounds and the addition of multi-use pathways in the Village. The recommendations in the plan may be considered by the Village at a future time, but the Village is not required to implement the projects; most projects will require further evaluation through the normal budgeting and bidding processes. The CORP is based directly on feedback provided by the outdoor recreation survey in January, the public workshop in February and input submitted during the draft process by e-mail and in person at the Committee and Village Board meetings. Thank you to all who participated in this process! Bicycle/Pedestrian Lane on Lighthouse Dr. Throughout the process of preparing the CORP, there was considerable discussion about the desire, both for and against, adding a bicycle/pedestrian lane on Lighthouse Dr. The Village Board decided that as a matter of public safety this topic needs to be explored further to determine what options are possible and feasible. A recommendation was added to the CORP to study bicycle and pedestrian safety issues (for the Village as a whole). The Village will be required to update the CORP at least once every five years. 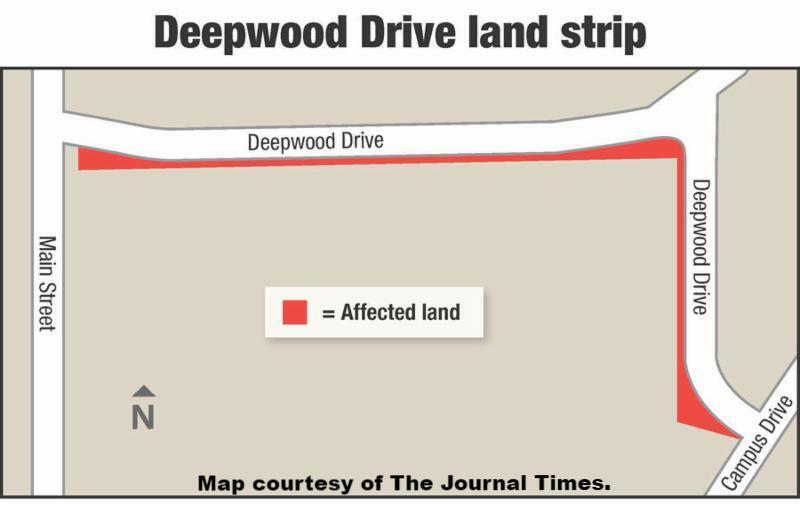 As discussed in the June E-News, the Village is working to resolve a road access issue along Deepwood Dr. On June 14, the Village Board unanimously approved a relocation order which initiates the process of acquiring a narrow strip of land that blocks access to the public road and incorporates it into the public right-of-way. The strip of land approximates two feet in width, 1,400 feet in length or about 0.25 of an acre. The strip is currently not on the tax roll and is not buildable. The process could result in eminent domain where the Village would compensate the owners the fair market value for the property. At the meeting on June 14, six members of the public spoke in opposition of the Village acquiring the strip of land. Their concerns dealt with the possible future uses of the adjacent property located at 4403 N. Main St., which is currently owned by the Village and zoned as R-1 single-family residential. 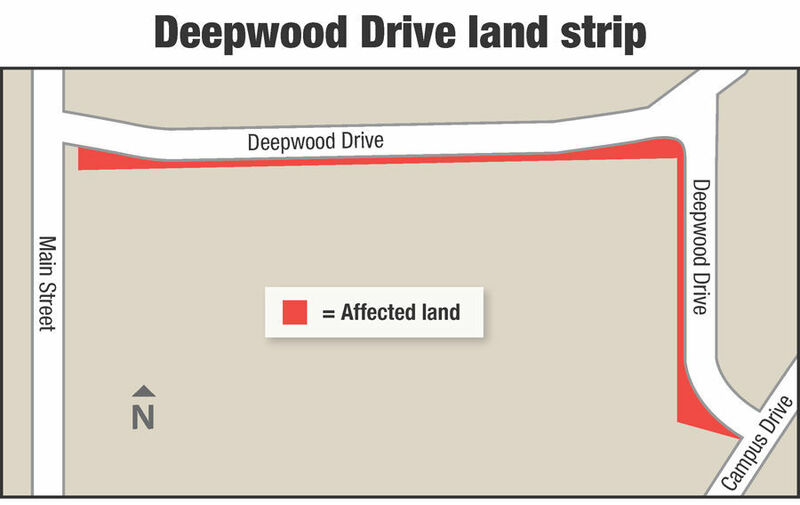 Concerns were also raised about future traffic on Deepwood Dr. It is important to note there are no current development plans for this property. The Village has prioritized the action of resolving the road access issue before considering options for the adjacent property. After the road access issue is resolved, the relevant Village committees will work through a multi-phase process to determine the best future use of the property for the Village as a whole. Look for updates on these matters in future E-News. A Partisan Primary election is just around the corner on Tuesday, August 14. Races on the ballot will include primaries for Governor, Lieutenant Governor, Attorney General, Secretary of State, State Treasurer, Rep. in Congress District 1, State Senator District 21, Rep. to the Assembly District 62, County Sheriff and Clerk of Circuit Court. Click here to view a sample ballot . In-person absentee voting is available at the Village Office from July 30 through August 10 during normal business hours, Monday through Friday 8 a.m. to 5 p.m. 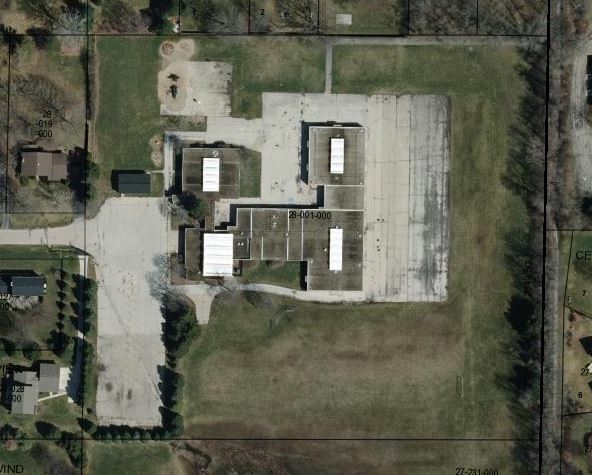 The owner of the former Wind Point School property (Newport Development) reports they are still in the process of preparing plans for their proposed future use of the property. Demolition of the buildings is complete and they studying the ground water characteristics and considering different drainage options for the property. Newport still plans to hold one or more meetings with neighboring residents to discuss their plan when it is ready. More information will be posted in this newsletter and on the project webpage when it is available. 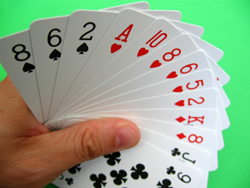 The Daytime Bridge Marathon is starting to plan for its next season. The group plays once a month from August through May. They are interested in having more Wind Point residents join! Please call Evelyn Gerum at 639-9351 or Marcia VanSusteren at 681-2406 with questions or to join. If you need a partner, they will try to find one for you. Only one partner needs to live in Wind Point. The Village of Wind Point Water Utility reads water meters on a quarterly basis to determine water usage to calculate bills. Homeowners can also use the meter inside their home to monitor water use and watch for signs of water leaks. The first step is to locate the water meter on your property; it is usually located in the basement or crawl space. Most meters look like the one pictured to the right. Dial: the dial will rotate when water passes through the meter. One full rotation of the dial equals 1 cubic foot of water or 7.48 gallons. Low Flow Indicator: the low flow indicator will rotate with very little water movement. Any water moving through the meter is detected so even small leaks will register. Odometer: the odometer records total water use in a similar way as the odometer in your car records miles driven. 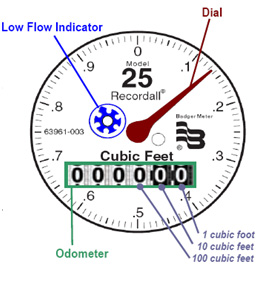 The water meter odometer records water use in cubic feet and displays as follows. The digits from right to left represent 1 cubic foot, 10 cubic feet, 100 cubic feet and so on. Like a car odometer, the water meter odometer cannot be altered. An easy way to check whether you have leaks in your house is to read your water meter. First, turn off all the water in your house. (Remember to wait for the hot water heater, toilets, and ice cube makers to refill, and for any regeneration of water softeners.) Next, go to your water meter and jot down all the numbers you see. Also look at the flow indicator gauge, which is a small red or black dial. If it is moving, then there is a leak inside the house. If it is not moving, then you do not have serious leak, but you may have a slow leak such as a toilet periodically refilling itself. Diagnosing and addressing a leak may require the assistance of a licensed plumbing professional. For more information on water billing and current rates, visit the Wind Point Water Utility webpage at windpoint.org/village-services/water-utility . Approved a relocation order relating to Deepwood Dr. Adopted the Comprehensive Outdoor Recreation Plan with discussed revisions. Approved the engineer’s recommendation to install yield signs and trim back brushes and trees at the intersection of Hollow Creek Rd. and James Ave.
Approved two conditional use permit applications to install solar panel systems on the roofs of 138 Eldorado Dr. and 5411 W. Branch Tr. Adopted the Racine County Hazard Mitigation Plan Update. Approved hiring Danny’s Catering for the Village Picnic. Approved reducing the donation fee amounts for Village Green amenities (for current stock of equipment). Approved Alcohol License Renewals for Shoop Park, Council House and Wingspread. Approved 11 renewal operator licenses and 4 original operator licenses. The next regular meeting is scheduled for Thursday, July 12 at 5:30 p.m. at the Village Hall (lighthouse).